We ordered 1,000 YouTube Views from SocialKing to see how well they could deliver their social media services. Overall the order went fairly well, with the views coming in on time. They didn't have a very high watch-time, however. Customer support was quick to respond to our questions with some informative answers, going over everything one by one. They have a 30-day money-back guarantee in case there's an issue with your order, which is a great sign. SocialKing is a good provider, with many other services you can use once you click the link below. SocialKing has been in business since at least 2017, and is registered in Spain. It's a very simple website, with plans for YouTube along with Twitter, Instagram, SoundCloud, and Facebook. The site is a bit sparse, with a couple of broken links. Although they lack information about their services, they do deliver the plans they offer. For YouTube, you'll find plans for Views and Likes. There's also a "Fast Order" option, but the stated delivery time is the same so it's unclear what the difference might be. 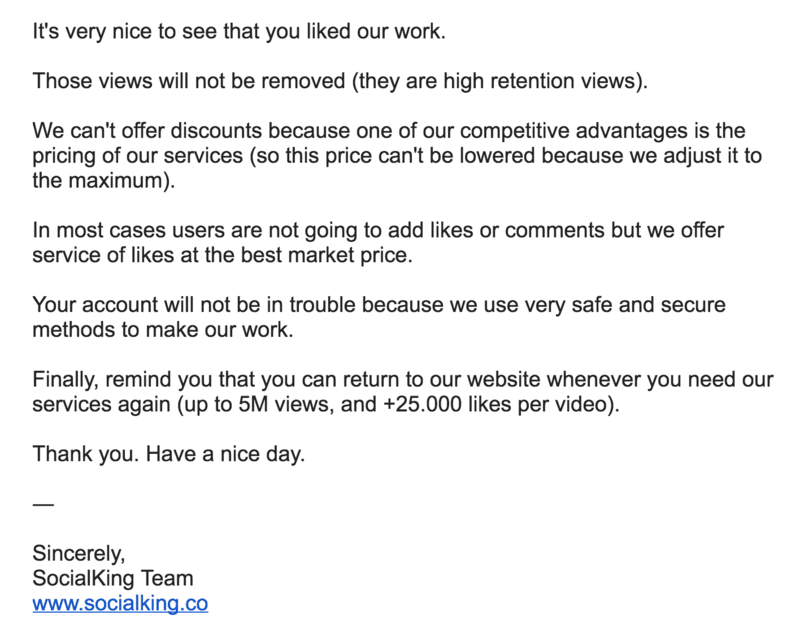 We reviewed the terms and conditions sections on the SocialKing website and made a few comments on their status below. To find out more details on these, then please toggle the sections to see what we thought! You won't find a Terms of Service on SocialKing's site, unfortunately. There is no information about refunds on SocialKing's website, but we learned from customer service that they do indeed offer refunds. According to customer service, "We offer 30 Day Money-Back Guarantee, so if you If you experience any type of problem with your order you can request your money back." There is no stated Retention Policy on SocialKing, but we learned from their customer support that you can get a refund if you lose Views. According to customer service, "Our methodology has never given our customers any problems, so you can rest easy. For peace of mind, if this happens we will refund your order without any problem, but we want to let you know that it has never happened to us." You can send a message to SocialKing by scrolling to the bottom of the page and clicking the "Support" button. 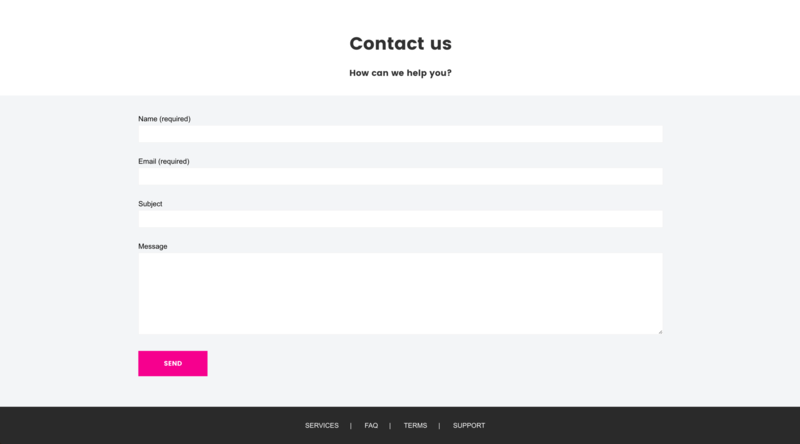 Then, use the contact form. 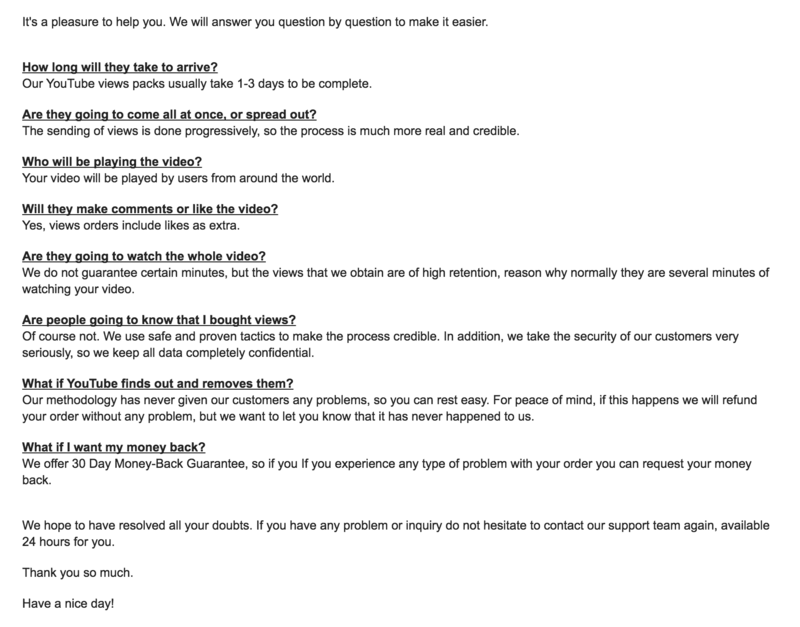 Before we ordered, we sent SocialKing some questions to see how good their customer support is. They answered pretty quickly, answering all of our questions one by one. Overall, an excellent response. "Our YouTube views packs usually take 1-3 days to be complete." "The sending of views is done progressively, so the process is much more real and credible." "Your video will be played by users from around the world." "Yes, views orders include likes as extra." "We do not guarantee certain minutes, but the views that we obtain are of high retention, reason why normally they are several minutes of watching your video." "Of course not. We use safe and proven tactics to make the process credible. In addition, we take the security of our customers very seriously, so we keep all data completely confidential." "Our methodology has never given our customers any problems, so you can rest easy. For peace of mind, if this happens we will refund your order without any problem, but we want to let you know that it has never happened to us." "We offer 30 Day Money-Back Guarantee, so if you If you experience any type of problem with your order you can request your money back." After an order finishes, we like to send another set of questions to see if they treat a paying customer any differently. Once again they answered our questions very well, going over all of them one by one. Another good customer support interaction. "Those views will not be removed (they are high retention views)." "We can't offer discounts because one of our competitive advantages is the pricing of our services (so this price can't be lowered because we adjust it to the maximum)." "In most cases users are not going to add likes or comments but we offer service of likes at the best market price." "Your account will not be in trouble because we use very safe and secure methods to make our work." We recommend the YouTube services of SocialKing if you want to boost your reputation on this platform with inflated views. However, the views we got weren't very high-retention, so if you want to buy views that will last your whole video, you'll need to look elsewhere. Try our Top YouTube Views Provider list for ideas. Our Views started arriving a couple days after we ordered them. They came all at once, in a big chunk. The Views we got from SocialKing didn't have a very high average watch time. The average watch time was just 34% of the video. The Views we got from SocialKing have stuck to our video, without being removed. Just as expected. We bought 1,000 YouTube Views to see if SocialKing could deliver as they promise. Overall we were fairly happy with the order, which came on time. The views were pretty low-retention, however, only going through 34% of the video on average. Customer support was very responsive, answering all of our questions neatly and concisely. An excellent interaction. They have a money-back guarantee if you have an issue with your order, or if the views are somehow removed. SocialKing are a good provider, with decent packages, and will be able to help you if you click the link below to visit their site. The friendly and very professional customer support agent i had a conversation with informed me of their money back guarantee in case anything went wrong with my order. I got my views delivered pretty fast and the retention rate was fantastic. Overall this is a superb service. We ordered our views and got them same day. What impressed us most was the average watch time which was way higher than what my team and I wanted. We are very pleased. I really didn't know that it was possible to have my YouTube videos gain more than their organic views, till I decided to try socialking. Still awed. Lifting a new video from just a handful of views, to several thousand views in a few days was pure magic for me! Customer support is very responsive and informative. Thank you for helping me with my recent order. I will definitely order soon. I really don't like buying views due to my previous experience with other providers. 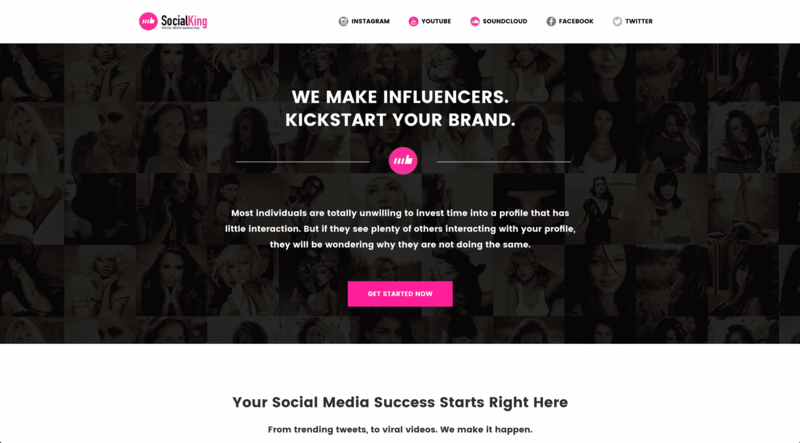 When I've heard of a relatively new company SocialKing, I gave it a try and didn't regret it a bit. They delivered and their customer support is simply phenomenal. I have to recommend them to everybody. My views were delivered in 24 hours. Awesome job. I just love the fact that their services is cheap. And they delivered as promised. MUST BUY! They delivered my views. I love it. I love the high retention rate I'm getting for my views. Highly recommended!